Improving mental arithmetic (calculating in your head) has been a long-term quest for me. My 3 daughters were subjected to numerical puzzle questions whenever we were on long journeys, and now none of them routinely use calculators, unless absolutely necessary. Arithmetic Brain – 8 different levels of 10 randomly generated questions about addition, subtraction and multiplication. Here are the links to Google Play and Amazon Appstore. 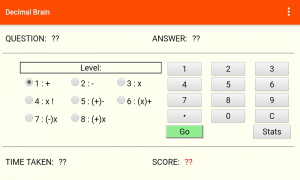 Multiply Brain – 19 different levels of 10 randomly generated questions on multiplication from x2 to x20. Here are the links to Google Play and Amazon Appstore. 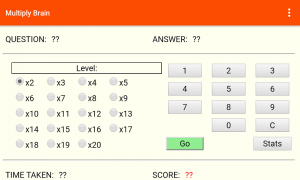 Decimal Brain – 8 different levels of 10 randomly generated questions about decimal addition, subtraction and multiplication. Here are the links to Google Play and Amazon Appstore. 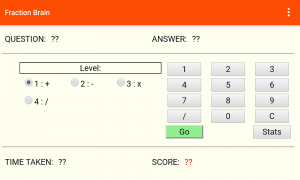 Fraction Brain – 4 different levels of 10 randomly generated questions about fraction addition, subtraction, multiplication and division. Here are the links to Google Play and Amazon Appstore. Full details about what is included in each Android app can be found on each app page.